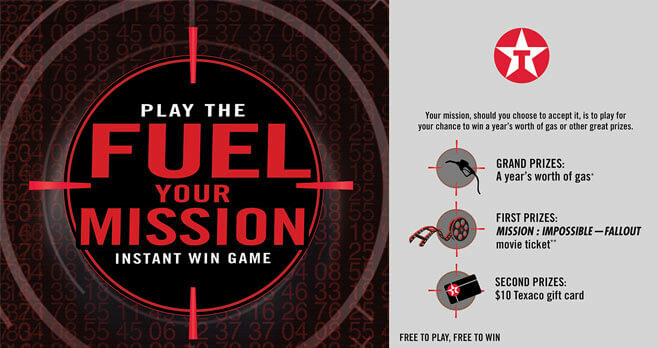 This summer, download the Texaco app and play the Texaco Mission Impossible Fallout Fuel Your Mission Instant Win Game for a chance to win a year’s worth of gas, MISSION: IMPOSSIBLE–FALLOUT movie tickets, or $10 Texaco gift cards. Ends: Ends at 11:59:59 PM PT on September 30, 2018. Prizes: Each of the 3 grand prize winners will receive a year’s worth of Texaco with Techron Gas, awarded as $1,488 in Texaco Gift Cards. Other winners will win either a $13 Fandango Promotional Code or a $10 Texaco Gift Card. Eligibility: The Texaco Mission Impossible Fallout Fuel Your Mission Instant Win Game is only open to legal U.S. residents of AL, AZ, CA, FL, GA, ID, LA, MS, NM, NV, OR, TN, TX, UT, WA and WY, who are 18 years of age (19 in AL) or older and located in one of the Eligible States at the time of Game Play.